A Holi Festival of Colors with theme “Bring the true Indian Cultural Spirit to Hanoi capital”, a popular festival that celebrates the coming of spring opened at the West Lake Waterpark, Hanoi on April 7. The festival was organized by the Indian Chamber of Commerce (INCHAM), a non-profit organization which has been at the forefront of bringing the rich culture of the Sub-continent to Vietnam. INCHAM has 10 years of experience in bringing this Indian traditional festival to friends in Vietnam. 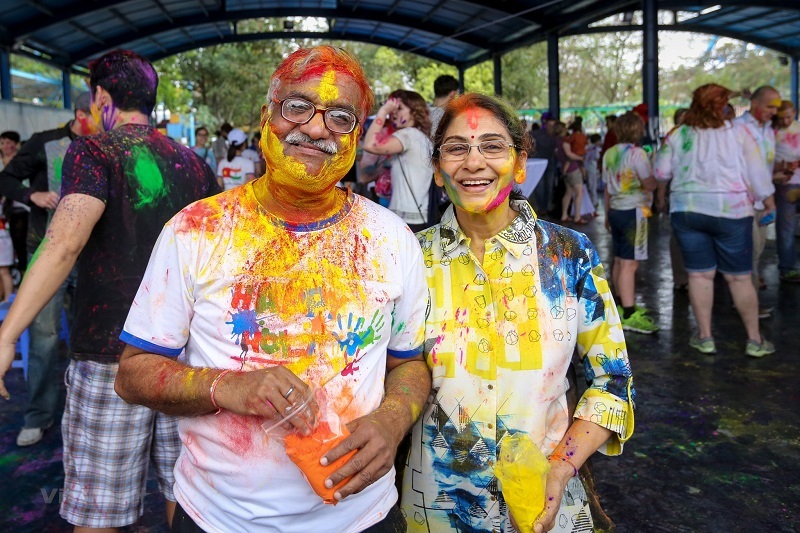 Speaking at the opening ceremony, General Secretary of INCHAM Vaibhav Saxena said that the event aims to introduce the Holi festival to Vietnamese and foreign visitors and creating the connection between the Indian community in Vietnam and the Vietnamese people. It’s highlighted by the colors and values of time-honored Indian culture, namely Indian cuisine and musical performances. Holi is a spring festival, also known by the name of the “festival of colors”. This festival is mainly seen in India Nepal and South Asia, but has recently spread to certain parts of Europe and North America. Celebrated all over India, Holi is a riotous event where colors are sprinkled and smeared on family, friends and even passers-by. Festivities begin in the morning and go on till noon. By then, everything is drenched in colors, a metaphor for the changing of season. It is an ancient Hindu religious festival, and has become popular among non-Hindus as well and is now celebrated beyond the Subcontinent.